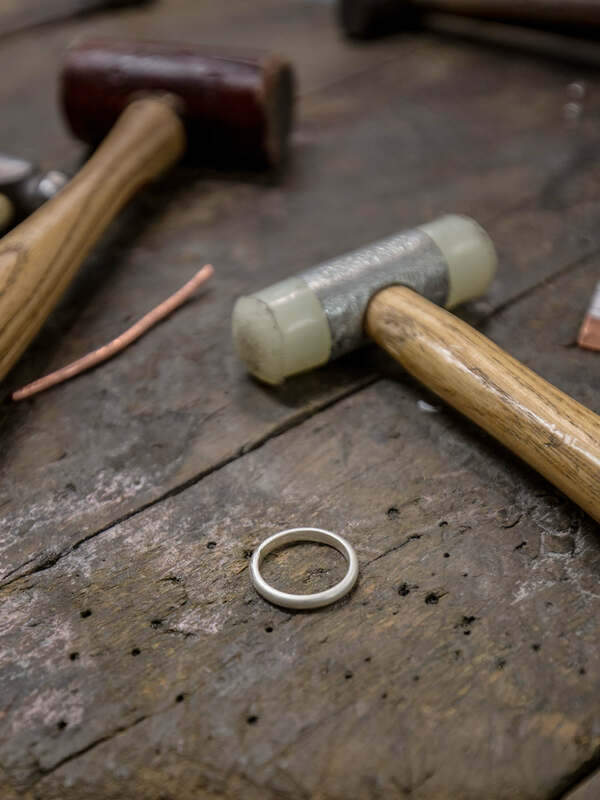 Feeling inspired to try something new, I booked myself a ring making class in Birmingham. After looking around, I stumbled across The QuarterWorkshop. 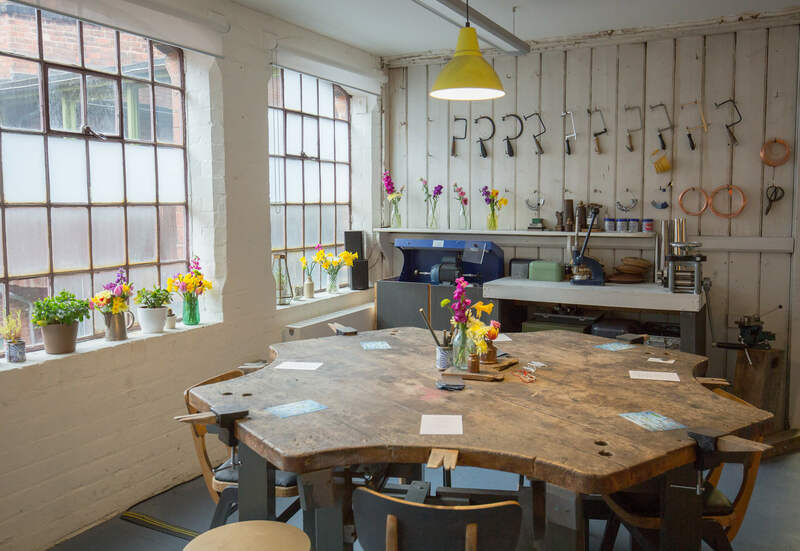 It is a lovely studio based in the heart of the Jewellery Quarter that offers a variety of different classes in Silversmithing. 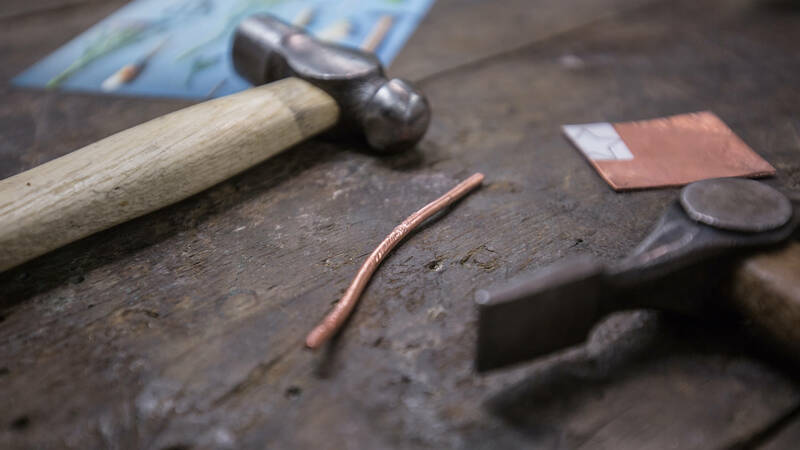 The classes teach you how to make your own jewellery as well as the steps along the way. You get plenty of guidance from an experienced teacher. 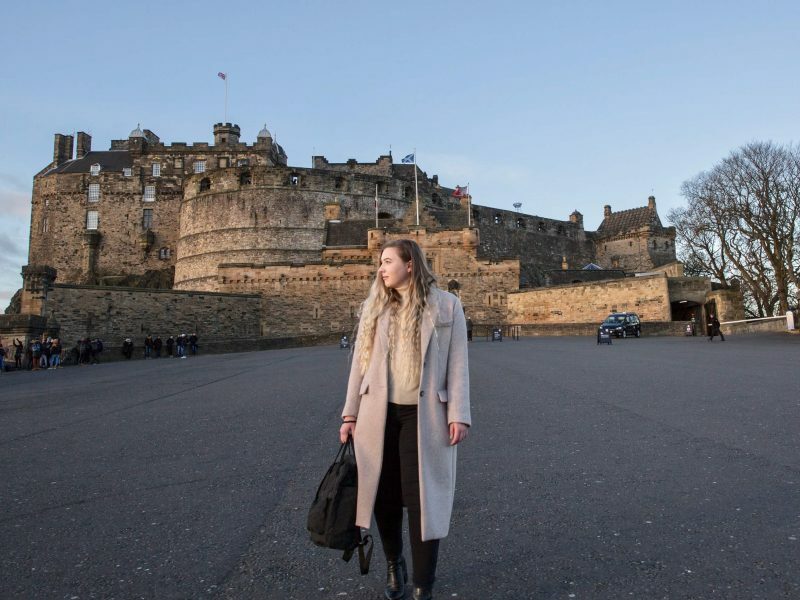 Meaning you leave with both the knowledge of making something from scratch as well as leaving with the jewellery that you have carefully created throughout the class. 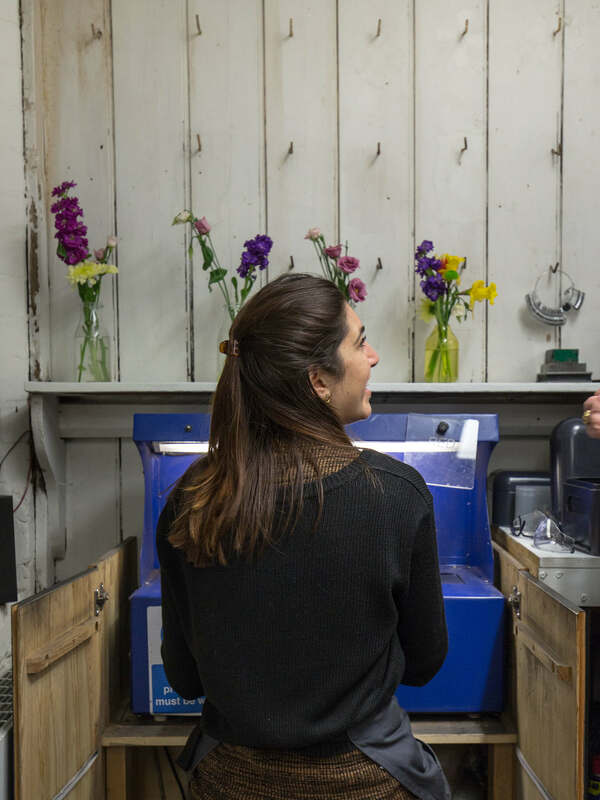 Based in a Grade 2 listed factory, the QuarterWorkshop has a studio that is fully equipped with all of the tools you could possibly ever need to make your own jewellery. 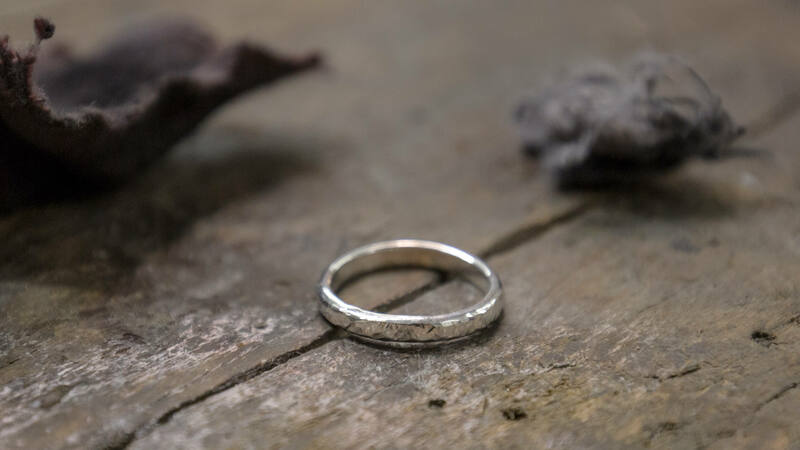 Set up by Victoria, a talented silversmith and jeweller who wanted to create a space for couples to come and create their own wedding rings. 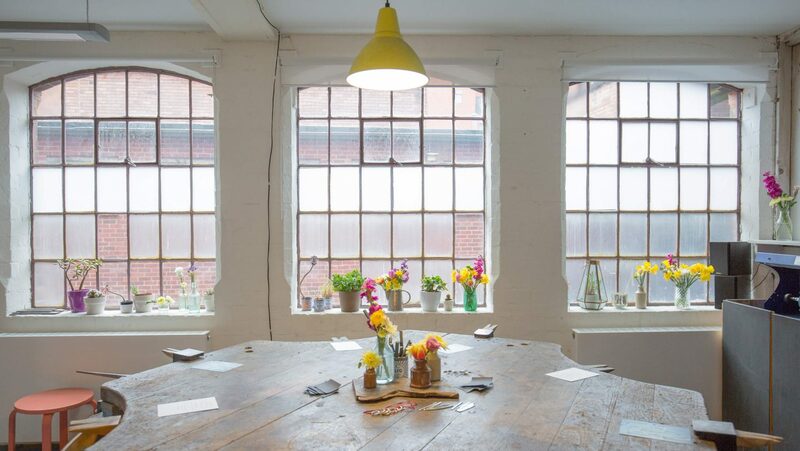 The decor of the workshop was absolutely stunning, with light pouring in and colourful flowers adorning the room. Mixed in with tools acquired over the years from Victoria’s Grandfather. It really sets the scene for the classes and the room is very inspiring to work in. 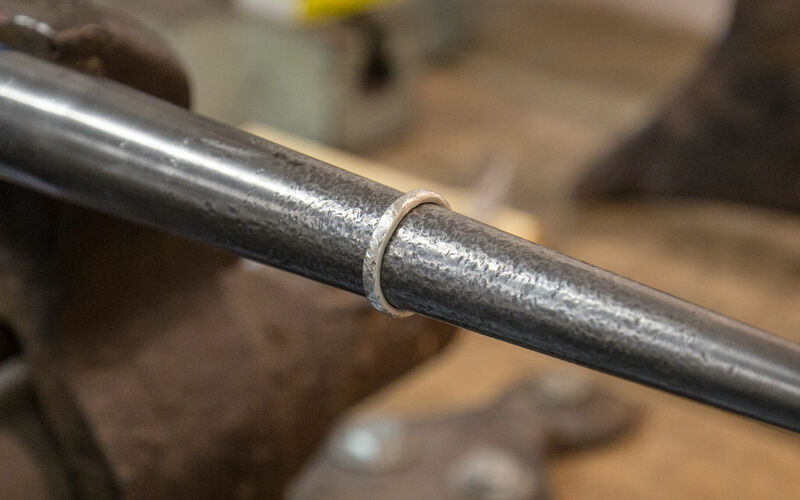 You can also make your own wedding rings! This is a great option for couples who are looking for something more personal for their wedding day. The class that I chose was the ‘Make a Ring in an Evening Class‘. This was a great way for me to get a taster into Silversmithing and learn the basics of how things are made. The class was taught by Roxanna who was an incredible teacher and was so helpful throughout the whole evening. The class began with a cup of tea and a few biscuits, a great way to start if you ask me. On the workbench, there were two different silver wires to choose from. With one being rectangular and the other being ‘D’ shaped. I went for the ‘D’ shaped wire as I felt that would suit my hand profile the most. The first step was to ensure the wire was straight. This was carefully hit on a flat surface before being placed onto a mandrel where the ends were bent into the shape of a ring. 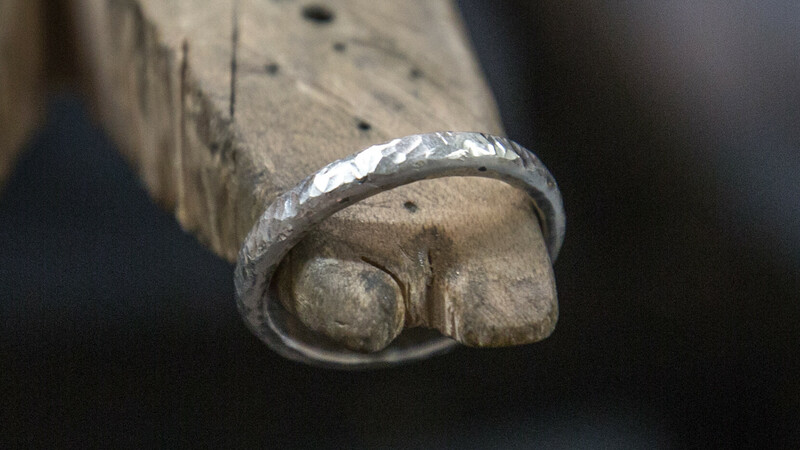 You start with the edges first, before slowly working the metal into a ring that fits your finger. Once the ring had a snug fit on the finger of our choosing, the overlapped edges were flattened down so they were flush against each other. The next step was to cut the ring down the centre of the overlap. My first cut wasn’t very straight as it went a bit wonky. In the process of trying to fix it, I got a bit too saw happy and accidentally cut my finger (whoops)! After that, I kept my fingers well away from the saw so I wouldn’t cut any more fingers open. Once the cut line was sitting flush against each other, after a bit of help from Roxanna it was then time to set the ring alight. This part was definitely the most challenging as heat needed to be distributed evenly across the ring, with the focus being on the join. 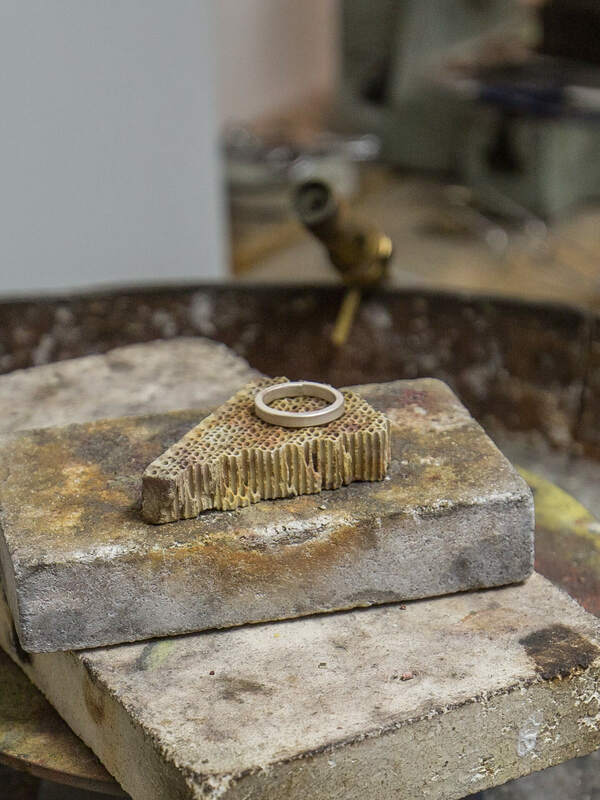 The ring was placed onto a ‘Honeycomb’ block which helped to distribute the heat across the metal more evenly. Some flux was applied to the joint as well as solder before using the torch to join everything together. It was quite hard to ensure the flame was moving constantly around the ring whilst using a turntable with the other hand to help assist with the movement. Thankfully the solder cooperated and the ring joined together perfectly. The ring was then placed in water to cool down and pickled in an acidic bath. It was then time to file down the joint. 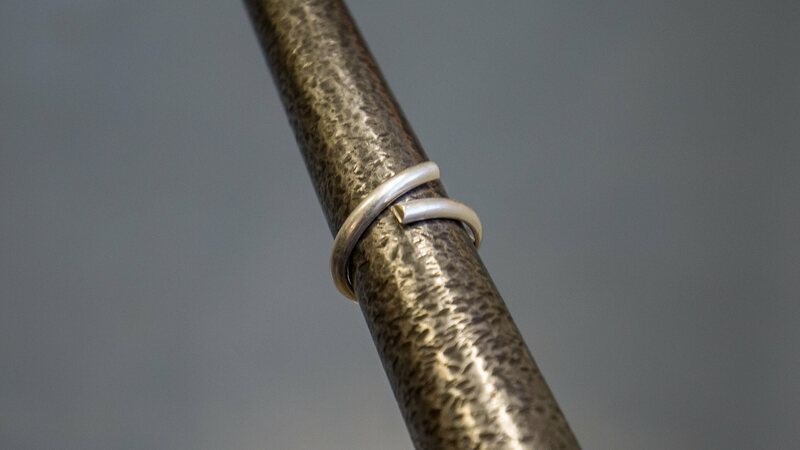 This created a smooth finish which meant we could get creative with patterns to decorate our newly made rings. For this part, we were given copper sheets and wire to experiment with. We had a range of different hammers to see what texture we were able to create with the various tops. The round-topped hammers created the typical ‘hammered’ effect ring. Whilst the chisel end was able to create lines along the ring with an ‘orange peel’ effect. I went with a mixture of the two to create different marks on the rings edges. This part was definitely the noisiest as everyone hitting their rings with the hammers! After picking the hammer of choice it was time to add marks onto the ring we had made. The ring went back onto the mandrel where we had initially bent our wire. But this time we were hitting the ring to create unique patterns along the band. It was a bit easier to hit the rectangular wire to add texture along the sides of the ring. It was a bit more challenging on the ‘D’ wire. I didn’t want to hit the edges too hard to distort the ring, but I still wanted some texture along the edges. Once you were happy with the overall texture on the ring it was time polish the ring. This last step was the most satisfying as your ring got brought to life! From being slightly dull to a reflective shine it was great to see the final results before taking the ring home with you. After having another break for tea, I moved onto polishing the ring with some wadding. This was applied to the inside of the ring and buffed out with a cloth, before giving the ring to Roxanna who did the final stage on the machine. Overall I really enjoyed the evening and it has definitely inspired me to book more classes in the future to advance my skills. 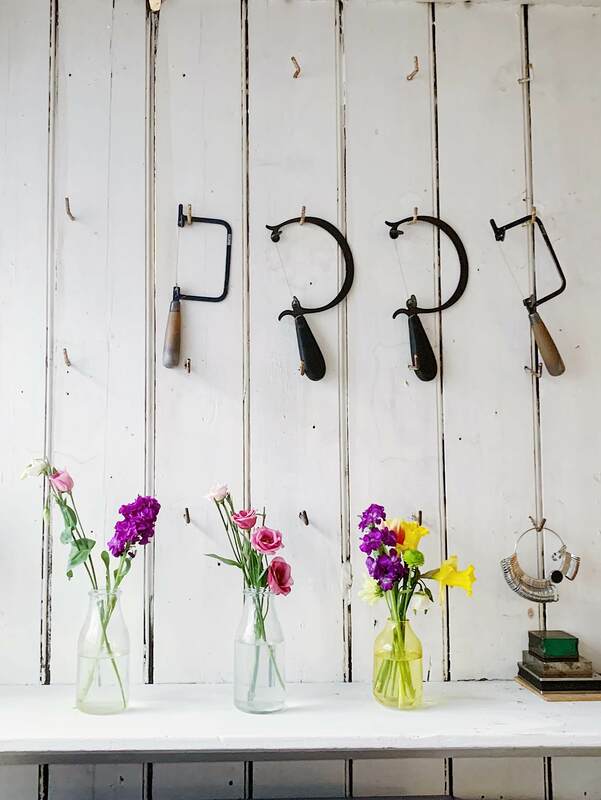 The class is the perfect chance to get a taster into making jewellery whether you go as a solo or with friends. It’s a great class to gift to someone and it can even be a fun and creative date night for a couple. As a more quirky and unique thing to do in Birmingham! The group is kept small with a maximum of 8 so you get plenty of help which is more one-to-one. This is great if you are struggling on a section and need a bit more experience. The weekday evening class was a great way to spend the evening and took just over three hours to make the ring from start to finish. They have other classes which fall on a weekend so you can find a time that suits you the most. 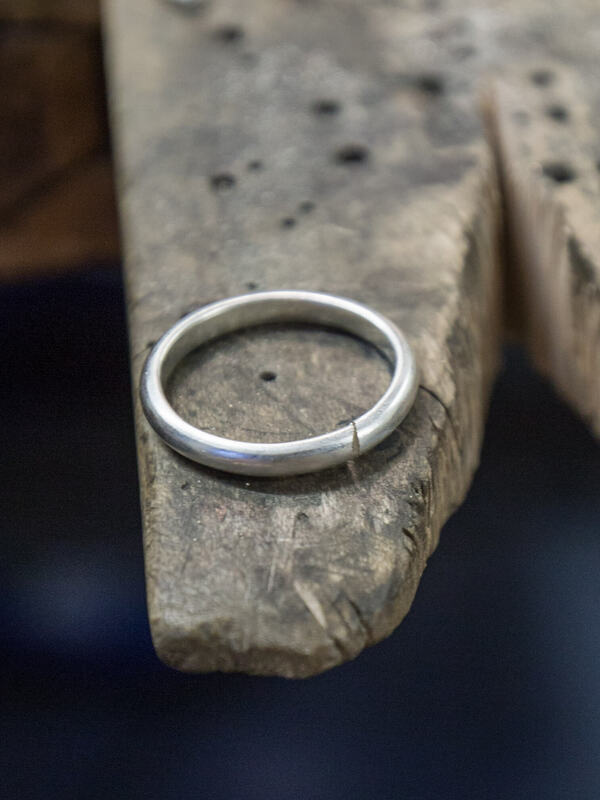 I’m looking forward to booking more classes with The QuarterWorkshop, I currently have my eye on the bangle making class as well as stacking ring class as they look like a lot of fun! I would love to know if you have ever gone to any classes? If so I would love to hear about it in the comments as well as what you have made! This class was purchased with my own money, but I did receive a discount code when booking the class. All opinions are my own and there are no affiliate links to The QuarterWorkshop.